From anomalies captured on digital devices not seen during filming, to glowing balls or light forms seen by the naked eye, this group of phenomena, often explained away as the as yet not understood phenomena of ball lightning, or as the “earth lights” proposed by Paul Deveraux caused by tectonic stress, (the build up of massive forces in the earth’s crust), or as simple anomalies caused by lens flare, or focussing anomalies within consumer grade digital camera devices, the light orb phenomenon is a conundrum which continues to generate much interest and heated debate between die-hard adherents of empirical science who insist upon repeatable experimental results to confirm theoretical data, and those who have already come to the realisation that many of the assumptions upon which we base our world views are not only incomplete but fundamentally incorrect. A) Balls (or other shapes) of light seen in the sky outdoors, often interpreted as ET craft, which can be accompanied by experiences of telepathic contact. B) Light orbs seen as part of a “ghost” experience, which can also have an aspect of telepathic communication. C) Light orbs of unknown origin, sometimes believed to be of “spiritual” or “astral” origin , which can be accompanied by telepathic communication . D) Light orbs of different shapes and sizes which appear within the domicile of people who claim contact experiences, which can be accompanied by telepathic communication, and direct sensory experience of the orbs. D) Circular orbs and orbs containing geometrical shapes, with and without “faces” . Such artefacts, according to analysis of photographic aberrations, can be caused by depth of field of the lens creating blur and distortion of an image ( a favourite theory of a friend of mine who is a professional photo-journalist), illuminated dust particles that are out of focus, dust in the lens, moisture in the atmosphere, automatic white balance settings causing changing colours within the orb “aberrations”, light reflecting off insects, conducive flash exposure settings causing lens flare, or any combination of the above. However, the significant point is that many photos and videos of orbs analysed by photographic and video experts, particularly videos, demonstrate that light sources captured are indeed anomalous and present as an object outside of the camera, and captured with reasonable accuracy subject to the obvious limitations of the equipment used. This being said, when the cameraman reports seeing the object exactly as it was captured on video, we are left in no doubt that the camera has not lied. The history of orbs goes all the way back to ancient times, and the will-o-the-wisp is a phenomena that has appeared almost universally in every culture, from Britain, to Europe, Asia, South America and even Australia. In England, they can be known as “fairy lights”, and for centuries have been associated with “fairy rings” , having been seen around the area where what we would now call “crop circles” appeared in the landscape. Curiously, this mirrors modern orb sightings, where they have been seen at the very moment of creation of crop circles, and apparently creating them. There is also an interesting association here with two folkloric ideas, that of abduction by fairies, stories of abducted people who return with timelines having been changed, mirroring the missing time and altered time of ET experiencers, and the changeling, a baby who is replaced by an elf child and has unusual abilities, echoing the ideas of ET abduction and perhaps a modified version of the “starseeds” concept respectively. Orbs have been depicted in ancient cultures throughout the world, and appear in relation to religious iconography, depicted in stone carvings, in Ancient Sumeria, Ancient Egypt, and other cultures, and chariots of fire and angelic beings in the form of balls of fire can be found in the bible. Throughout history there are written reports of large orbs appearing over major cities across Europe, in 329 BC Alexander the Great was unable to continue on his route due to “two silver shields, spitting fire around the rims”, and appearing on Christopher Colombus’s voyage to the New World in 1492, an orb was spotted resembling a wax candle that rose up out of the water and shot into the skies. In the twentieth century, glowing balls of light of various colours have been seen perhaps more frequently than ever before, the most common type of UFO reported being a glowing ball of light, with colours varying enormously from white through to oranges and reds, blues, purples and even changing colours within the same sphere. There has even been speculation that rapidly changing colours represent a form of language either between craft or to be interpreted and understood subliminally by the human viewer / experiencer. Other light forms have been seen including glowing squares, rectangles, and giant cylinders from which round orbs have been sometimes seen to emerge, that can be, as in a sighting by a pilot flying over Aldeney UK in 2007, up to two miles wide. At the spiritual centre in Trout Lake Washington U.S.A, known as ECETI ranch, James Gilliland, meditation teacher and facilitator of ET contact for many of his visitors, regularly videos and photographs orbs, which, defying the photographic critique of orbs, are seen both to the naked eye and on camera . This highlights the consciousness related aspect of orbs, whereby it is proposed that calm and coherent thought, instigated by meditation / altered consciousness, and visualisation techniques, can create an interface with other-dimensional beings, allowing them to “zone in” on the location of the caller. The consciousness aspect of ET and other-dimensional contact is one that has not yet been fully documented or explored, but there is an interesting parallel here with the work of mediums, who are able to enter an altered state of consciousness and facilitate the apparent communication with the dead. During many of these seances, light orbs and flashes of light of many different shapes and colours have been known to appear and have been video’d. In ghost hunts there have also been many sightings, both on and off camera, of these glowing orbs of light. My own experience, which i know is paralelled by the experience of many others, is that i have had orb sightings both during experiences related to ghosts / communication with the deceased, involving telepathic communication, ( the recently deceased ex husband of a former girlfriend telling me where lost family photos were) and also in orb sightings with ETs, where as an example, i have had telepathic communication which involved hearing my own voice, using my own manner of speech / phraseology telling me to “grab a camera and go outside, you’re about to see some UFOs”. It is in this point that the interesting riddle lies : why do ETs, deceased spirits, and beings encountered in mystical experiences often appear as luminous balls or light forms, when apparently they seem to be a disparate grouping of manifestations? Perhaps the clue to this lies in the theory of multiple dimensions proposed by Quantum theory. If all these phenomena derive from other dimensions and either require significant amounts of energy to manifest in our dimension,or release significant amounts of energy on arrival, then logically one might assume that there would be an associated energy manifestation which would cause , perhaps, ionisation / vaporisation of the gases and other materials in our physical environment. The implication of orbs as experienced by many people, deriving from other dimensions, whether ET or ghostly / mystical in form, is that consciousness itself can attune to other dimensions and aid in the appearance of other-dimensional beings. It also suggests that death, as we know it, is not an end, which is supported by the theory of the First Law of Thermodynamics, which states that energy cannot be created or destroyed, but simply changes form. Erwin Rudolf Josef Alexander Schrödinger, one of the founders of quantum theory, and an avid reader of hindu mystical texts, once stated ” Multiplicity is only apparent, in truth, there is only one mind”. If then there is no separation in the universe, and all beings are united fundamentally in a singular consciousness which encompasses the multiverse, then we should not be surprised by the many telepathic experiences that accompany the arrival of other beings who have crossed dimensions to be with us. Consciousness is unbounded by the limitations of the laws of physics as we know it, and at any given time, there are light orbs announcing the arrival of beings from other dimensions. In the released Ministry of Defense U.F.O files by the British Government, the conclusion states that light orbs are extraterrestrial in origin, that the plasma balls can interact telepathically with human beings, and that they may be of significance for possible military development. It is clear that while some light orbs are photographic anomalies, many orbs and light forms seen, and experienced by people, along with telepathic communication, synaesthetic sensory experiences, orbs physically interacting with people and even apparently causing spontaneous healings and emotional / mental changes, usually for the better, are indeed sentient beings which manifest in the form of light, and interact with us on every level of our human experience. 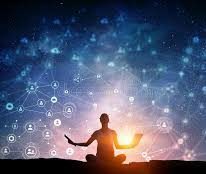 The challenge for the future will be to learn to interact peacefully with love, with these ET beings, by developing telepathic communication techniques and forming a cultural bridge between civilisations. Orbs of light challenge the status quo of our scientific world view, whether as ET orbs or ghostly balls of light, they recall the “spooky action at a distance” of Albert Einstein, they accompany the spiritual aspirations of our culture going back millenia, and they lead us, like the will-o-the-wisp, to a future where humanity looks beyond the tangible and physical , beyond even the stars, to higher realms of consciousness, and a direct understanding of the universal consciousness, the one mind which underlies the creation, and to a new understanding of our place in our cosmic family.